Over the last few years, following the economic downturn in 2008, precious metal coins have gained popularity again. Investors seek to diversify their portfolio by including bullion coins that are less susceptible to volatile market developments. Although the US Mint produces high-grade gold and silver coins, many investors also like to purchase foreign coins as they are “exotic” and often have higher purity than American bullion coins. The Canadian Maple Leaf coins are among the purest and most beautiful coins on the market. The first coins to be used in Canada were introduced by French and English colonizers in the 18th and 19th century. In 1841, the Province of Canada introduced the new Canadian pound which was equal to 4 US dollars. In the 1850s, the Canadian population debated whether to adopt a sterling monetary system similar to the British pound or a decimal monetary system based on the US dollar. As a compromise, the Canadian parliament passed an act that introduced the gold standard in Canada, based on both the British gold sovereign and the American Gold Eagle coins. In 1858, the first Canadian coinage was was authorized and executed and soon, all Canadian provinces were using the coins. The Dominion of Canada came into existence in 1867 and the first domestically-struck coin was produced in 1908. The Canadian Maple Leaf is one of the most desired bullion coins due to its unmatched purity and recognizable design. The Gold Maple Leaf was the first ever .9999 fine gold bullion coin and set the standard for other gold bullion coins. This means the coin contains virtually no base metals like silver or copper and consists of gold from Canadian mines. Similarly, the Platinum Maple Leaf was the first widely available platinum coin and established the standard by which other platinum coins are compared. The Canadian government has also issued a number of rare commemorative coins which can sell for a very high price. Each coin is manufactured to meet the high quality standards of the Royal Canadian Mint, which is world-renewed for quality, craftsmanship and innovation. All Maple Leaf coins have legal tender status in Canada for their face values and are subject to the Canadian Currency Act and the Royal Canadian Mint Act. Their weight, purity and face value of each coin are guaranteed by the Canadian government. Moreover, they are also eligible for precious metal IRAs. As Canadian Maple Leaf coins have such a recognizable design and exceptional purity, they are an excellent investment opportunity for people interested in precious metals. Whether you wish to purchase a classic gold bullion coin or get your hands on a more “exotic” issue like the hologram commemorative coin, the Canadian Maple Leaf won’t disappoint you. Contact a SBC Gold representative if you have further questions on Canadian precious metal coins or look below for various coin options and availability. The Canadian Gold Maple Leaf was first struck by the Royal Canadian Mint in 1979 to satisfy the demand for gold coins after the South African Krugerrand was boycotted. The Gold Maple Leaf is one of the purest bullion coins with a gold content of .9999 (24 karats). Some special issues even have a purity of .99999 fine gold. In 1988, the Canadian Government started issuing . 9999 fine silver and .9995 fine platinum Maple Leaf coins. 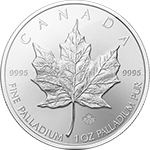 In 2005, the Royal Canadian Mint also produced a .9995 palladium Maple Leaf coin. The Canadian Maple Leaf is one of the most popular investment coins. Produced by the Royal Canadian Mint, the Canadian Gold Maple Leaf is the official gold bullion coin of Canada and enjoys an enviable reputation among collectors and investors. The Silver Maple Leaf generates prices above its bullion value, usually about $3 to 4 over spot in the year of issue. However, during 1996 and 1997, for example, Silver Maple Leaf sold in the $60 range for due to very limited mintages. The Canadian Platinum Maple Leaf is the official platinum bullion coin of Canada was introduced in 1988, the same year as the Silver Maple Leaf. Yet, the Royal Canadian Mint only produced the platinum coin between 1988 and 2002. Canadian Palladium Maple Leaf coins can be included in a precious metals IRAs. They fit the standard of purity, and the Canadian government backs the purity guarantee.